Please allow 10 business days for your order to be custom made before shipping. This personalized cutting board with words makes for a custom gift that is also well-made and functional. Each one is handmade in the USA from maple wood and features a hand-cut expression or name. Whatever words you choose, the care put into creating each board shines through. Dimensions: 9.5" x 12.5" x 1.13"
Kim Strassner and Mike Pararas began making personalized cutting boards with words on them as holiday gifts for friends and family. The pieces were such a hit, they founded Words with Boards so anyone could give or receive one. Their wooden serving and cutting goods are handmade in Maryland. 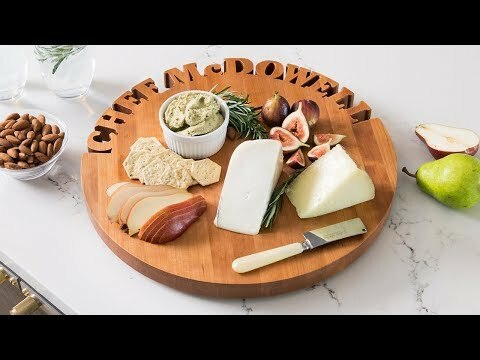 Kim and Mike have a few expressions of their own (like Cheese and Happy Hour), or you can customize a board with your own words or a date, name, or location for a truly custom piece. The boards and Lazy Susan servers are all hand-cut, hand-sanded, and then hand-sealed with food-grade mineral oil. That hard work pays off with a beautifully finished piece that showcases the natural maple wood and crisp, precision-cut lettering. Each one strikes the perfect gifting balance of handmade and heartfelt.